A sitting stepper is similar to a stair stepper found in many gyms, but much smaller. Most of all, a sitting stepper is a great help when you have to sit. For example, you may have a job that requires a lot of sitting. Or, you may be at home, watching TV, working on your laptop, and so on. The best sitting and desk steppers listed below are principally used while sitting. Therefore, they do not come with handles. While they could be used in standing mode, it is recommended you do not use them in that mode if you have problems maintaining your balance. The best steppers listed below are listed in descending order of reviews. Especially relevant, desk steppers are mini steppers without the pole like handles to hold on to. And because they are compact, desk steppers can be used at work while you are sitting down at your desk. Furthermore, you can use the sitting stepper at home while you are sitting on the couch, at a table or desk, or anywhere you are sitting. The sitting stepper or the desk stepper is comprised of two independent footplates (also known as pedals) that move up and down. Moreover, some versions of the sitting stepper also come with handles. And these handles help you maintain your balance when you use the sitting stepper while standing. Because the handles are generally not easily removable, sitting steppers with handles can’t be used under the desk or table. And, even if used while sitting on a couch, the handles become a distraction. Therefore its best to get a sitting stepper without the handle if you intend to use it while sitting. Most of all, to use the sitting stepper, you simply step on the footplates and push down with each foot. Next you move your feet in a stepping or climbing motion. Meanwhile, the adjustable hydraulics provide resistance as you push the footplates down. Most of all, to use the standing stepper you use your body weight to push down on the footplates. So, to increase the stepping rate and get a better aerobic exercise you quickly shift weight from one to the other. However, avoid bouncing or jumping on the footplates so that you get the most health benefits while standing on the stepper. On the other hand, using the sitting stepper or the desk stepper, you have to push down on the footplates with your legs. As a consequence the pushing action exercises your leg muscles. However, the stepping rate is not as high as with the standing stepper. As a result you burn less calories when you use the sitting stepper or the desk stepper. Meanwhile, the desk or sitting stepper, frees you to do other work such as reading a book, using your computer, cell phone, making phone calls. On the other hand, the standing stepper significantly hinders these activities from being done concurrently. Up and down movement tightens and tones your calves, gluteal muscles, and hip flexors. Furthermore, over 89% of users gave it four or five stars. You can’t lose with those kind of ratings. First and foremost, the EFITMENT fitness stepper is 17 inches long, 12.5 inches wide, and 7.5 inches high. Moreover, the low height may allow it to be used under a desk or a table. Next, the mini stepper's LCD monitor displays exercise duration, step count, steps per minute, and calories burned. Meanwhile, the scan function sequentially rotates through these values. Most noteworthy, the footplates are wide, textured, and non-slip. Consequently, the footplates will accommodate a broad range of feet and shoes. Especially relevant, the pedal height is adjustable. Therefore, by adjusting pedal height to limit vertical pedal movement may allow you to use the EFITMENT fitness stepper under a desk. Also, hydraulic power provides a smooth and quiet workout. However, the hydraulic resistance is not adjustable. Meanwhile, the EFITMENT fitness stepper comes with a 3 years manufacturer’s warranty. Indeed, a 3 year warranty is significantly longer than the usual 1 year warranty and speaks volumes for the quality of the stepper. In addition, the sitting stepper weighs 15 pounds, making it easy to lift and move to storage or other locations. Finally, the weight capacity of the EFITMENT fitness stepper is 220 pounds when standing. Indeed, anyone heavier may exceed the design limits of the stepper and potentially cause it to break. Only 7.5 inches high. Consequently it can be used under a desk or a table. First and foremost, the body of the HARISON mini stepper is made of heavy duty super sturdy and smooth steel. Next, the mini stepper is 15.7 inches long, 11 inches wide, and 12.4 inches above the floor at the pedal's highest point. Also, the mini stepper's LCD monitor displays exercise duration, step count, strides per minute and calories burned. Meanwhile, the scan function sequentially rotates through these values. In addition, the anti-skid rubber feet prevents the mini stepper from skidding on smooth floors while providing a smooth and quiet workout. Most noteworthy, the footplates are slip resistant with a surface that provides foot massage. Moreover, the footplates don’t need you to wear shoes. Especially relevant, the pedal height adjustment knob adjusts height of step motion which in turn changes hydraulic resistance. Moreover, lowering the pedal height also makes it possible to use the stepper under a desk or a table. Also, the hydraulic resistance provides a smooth and quiet workout. Meanwhile, the EFITMENT fitness stepper comes with a 12 month warranty with free replacement parts. In addition, the sitting stepper weighs 14 pounds, making it easy to lift and move to storage or other locations. Finally, the weight capacity of the HARISON mini stepper is 220 pounds when standing. Indeed, anyone heavier may exceed the design limits of the stepper and potentially cause it to break. Most noteworthy, this mini stepper moves up and down and side to side in a low impact twisting motion. In addition, hydraulic resistance provides smooth and quiet workout. First and foremost, the body of the Harvil mini stepper is made out of heavy duty steel. Next, the mini stepper is 15.74 inches long, 18.11 inches wide, and 11.81 inches high. Especially relevant, the 18 inch width increases it's stability. Meanwhile, the low height may allow the Harvil stepper to be used under a desk or a table. Also, the Harvil stepper's LCD monitor displays exercise duration, step count, total step count, and calories burned. Most noteworthy, the footplates are large and wide with non-slip characteristics. In fact, the footplates are 12.72 inches long, 5 inches wide, 1.5 inches high. Consequently, the footplates accommodate a wide variety of feet size and shoes. Especially relevant, at its highest point, the pedal is 11.81 inches above the floor, while at its lowest point, the pedal is 3.85 inches above the floor. Moreover, the height adjustment knob can be adjusted to lower the pedal height. As a result, you may be able to use the stepper under a desk or a table. Furthermore, the height adjustment knob also changes the hydraulic resistance. Meanwhile, the Harvil mini stepper comes with a 90 day free replacement part warranty. In addition, the sitting stepper weighs 17.6 pounds, making it easy to lift and move to storage or other locations. Finally, the weight capacity of the Harvil stepper is 220 pounds when standing. Indeed, anyone heavier may exceed the design limits of the stepper and potentially cause it to break. When used in the standing mode with the resistance bands, the stepper tightens over 20 different core muscles including your chest, back, shoulders, inner and outer thighs, abs, and obliques. Simply, remove the resistance bands to use as a sitting or desk stepper. Lastly over 79% of the users gave it four or five stars. You can’t lose with those kind of ratings. First and foremost, for lasting durability, the body of the stepper is made out of industrial strength steel. Next, the Sunny mini stepper is 16.5 inches long, 12.5 inches wide, and 8 inches high. Most noteworthy, the low height allows the mini stepper to be used under a desk or a table. Also, the Sunny stepper's LCD monitor displays exercise duration, total step count, steps per minute, and calories burned. Meanwhile, the scan sequentially displays these exercise measures. Most noteworthy, the footplates are wide, textured and have non-slip characteristics. In addition, the footplates twist side to side. Especially relevant, adjusting the pedal height changes hydraulic resistance. In addition, the height adjustment knob adjusts step motion height to give you either short or long steps. Therefore, if you want to use this stepper under a desk or a table, use the adjustment knob to lower pedal heights. In addition, the sitting stepper weighs 14.5 pounds, making it easy to lift and move to storage or other locations. Finally, the weight capacity of the Sunny stepper is 220 pounds when standing. Indeed, anyone heavier may exceed the design limits of the stepper and potentially cause it to break. Sitting Steppers made of heavy-duty alloys or steel are preferable. At least the frame should be metal. And, since you are going to push them hard, the footplates should be made from heavy duty plastic or better. Displays help you keep track of step counts, speed in steps per minute, exercise time, and calories burned. Most of all, there is an additional constraint, if you going to use the desk stepper under a desk. First you need to measure the distance between the top of your knee, when sitting on a chair, and the floor with your shoes on. Next you need to measure the highest point the top of the foot plate reaches above the floor. Next, the sum of these two numbers needs to be less than the distance between the bottom of the table or desk top and the floor. Footplates should have a non-slip surface keep your feet secure and stable. In addition, footplates should be large enough to support your entire foot. For the most part, hydraulic cylinders with a piston provide the resistance. Incidentally, a heavy-duty hydraulic cylinder will not overheat after only 10 to 20 minutes of use and will let you exercise for at least 30 minutes or more before it starts to heat up. Furthermore, you may want to be able to adjust the intensity of your workouts. Indeed, this is likely true when you are using the sitting or desk steppers for aerobic workouts while standing. On the other hand, when your predominant need is simply to get your legs moving while sitting, the need to change workout intensity is likely not there. As a result, the need to be able to change resistance settings or even have the ability to do so, is a decision you may have to make. But it’s an important decision because sitting and desk steppers either have the capability to adjust resistance or they do not. Because desk steppers likely would be used in office environments, they need to run as quietly as possible. The longer the warranty period the better you are protected against loss from manufacturing defects. Generally, a 90 day period will cover the majority of manufacturing defects. Since most defects are found in this period, it’s important to ensure your purchase is covered during that time. The weight capacity is relevant only if you are going to use it in the standing position. On the other hand, if your plan to use it while sitting down a machine with a weight limit of 220 pounds is more than adequate. Most of all the weakest links in the sitting or desk steppers are the pedals and the hydraulic piston. Obviously misuse can easily damage these components. However, if you only intend to use the steppers while sitting at home or in the office, they will last a long time. 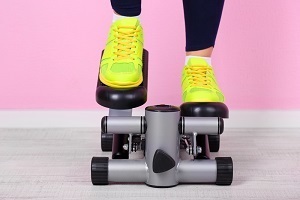 In any case, it’s always a good idea, especially if you later decide to use the steppers for aerobic workouts, to get a good quality sitting or desk stepper. According to the 2017 American time use survey by Bureau of Labor Statistics, the average American over the age of 15 spent on average 8.78 hours each day sitting doing activities like, eating, drinking, working, attending classes, doing homework, watching television, socializing, being on the phone, going through mail and emails. Most of all, a sitting stepper helps lessen the negative effects of sitting. Also, because the sitting stepper is smaller it is affordable. In addition, the sitting stepper can be easily moved around and stored away when not being used. In fact, the sitting stepper is also a desk stepper because it can be used either at home or in the office. Furthermore, adjusting the resistance of the standing stepper allows you to burn even more calories. For example, a 175 pound person using the standing stepper for 60 minutes could burn 556 calories as opposed to 504 calories with very low resistance. Meanwhile, the sitting stepper also helps you burn calories. In fact, according to Dr. James Levine of the Mayo Clinic, using the desk stepper under your desk while at work can help you burn about 100 calories in one hour of use. Or, you can burn about 100 calories in an hour using the sitting stepper while watching television. Especially noteworthy, a lean person, using the sitting stepper at a leisurely pace of 13 steps a minute or one step every 4.6 seconds, burns about 100 calories in an hour. On the other hand, if your other concurrent activities don’t need as much of your attention, you could speed up the pace to say 26 steps a minute or one step every 2.3 seconds. This pace would double the calories burned to 200 in one hour. While an obese person using the sitting stepper at a leisurely pace of 10 steps a minute or one step every 6 seconds, burns about 108 calories in an hour. Similar to the discussion in the previous paragraph, you could double the calories burned to 216 calories in one hour by picking up the pace to a step every 3 seconds. Therefore, you can use the sitting or desk steppers to lose weight. In fact to lose one pound you have to burn 3,500 calories. Therefore, if you burn 300 calories daily you will lose one pound in 12 days assuming you ate the same calories as you normally do. However, to burn 300 calories in a day, you would have to use the sitting or desk stepper for 3 hours each day. Something that’s possible if you sit a lot at work or at home. Finally, regular use of the sitting stepper, will also increase your resting metabolic rate. Lean adults stepping at 39 steps per minute burned on average 312 calories per hour or 0.13 calories per step. In fact, the 313 calories was an average for all the lean adults ranging from a minimum of 221 calories to a maximum of 403 calories. Meanwhile, obese adults stepping at 40 steps per minute burned on average 433 calories per hour or 0.18 calories per step. In fact, the 433 calories was an average for all the obese adults ranging from a minimum of 324 calories to a maximum of 542 calories. Lastly, the study reported that everything else being equal, using the standing steppers for 2 hours a day can result in losing 44 pounds in a year. As another data point, Harvard Health published the following. Meanwhile, the American College of Sports Medicine points out that many sitting stepper users feel uncomfortably restricted by the small size of the sitting stepper. Consequently, the sitting stepper may not give you the workout you want. But if you like the way the sitting stepper feels or you get used to its compact size, the sitting stepper provides some cardio workout. Sitting and desk steppers provide benefits of a cardio exercise. In fact, the repetitive stepping motion of the desk stepper mimics climbing. As a result, your heart and lungs work harder thereby providing an aerobic workout for improved cardiovascular health and increased endurance. Most of all, desk steppers offer a portable, affordable and convenient means to supplement your other daily workouts. Most noteworthy, exercise machines, in general, move your body forward. Desk steppers, on the other hand, require that you move vertically with an up and down motion of the legs. In fact, desk steppers work your lower body, toning your legs and hips. Because your range of motion is limited on the desk stepper, your muscles will get some exercise. In fact, the desk stepper uses the same muscles as you would when you walk or climb stairs. Indeed, the muscles that get exercised include the hip muscles, hamstrings, quadriceps and calf muscles. And, the more you use the desk stepper the stronger the muscles become. As a result, with time your leg’s muscular endurance increases. Lastly, to prevent injury or get sore muscles, it’s important to stretch before and after using the desk stepper. The sitting stepper as well as the desk stepper help you in the following ways. First of all standing, for long periods creates excessive pressure on the legs, which can lead to varicose veins. While using the sitting stepper helps prevent varicose veins. Prevents swelling of feet, ankles, and legs from water retention due to edema. Indeed, regular use of the sitting stepper, will reduce these symptoms of edema. Reducing damage to the knees. In fact, the low impact sitting stepper does not cause body joints to get jerked or suddenly shocked. However, while the sitting stepper does not harm the knees, people with sustained injuries or weak knees should consult a doctor before using the sitting stepper or the desk stepper. Most of all, sitting and desk steppers are used to get your legs moving when you have to sit for a long time. Consequently, their use is not the same as when you stand on the steppers to get a cardio workout. Nonetheless, it’s healthy to follow similar protocols for their use. Warm up is pretty straightforward. In fact, start using the sitting or desk steppers at a slow stepping pace. And keep this up for five minutes or so. Once you have warmed up, increase the stepping to what is possible in your environment. For example, if you happen to be at work and the phone starts ringing, slowing down the stepping pace is natural. On the other hand, if you are surfing the web or doing activities that don’t need your intense concentration, then, yes, speed up your stepping pace to whatever you are comfortable with. Cooling down shouldn’t interfere with whatever you happen to be doing. For example, if you have to get up and leave the desk or the couch, then go. On the other hand, if you know you have to come to a stop, then slow down your stepping pace for the last five minutes. To use the desk stepper or the sitting stepper, sit up straight close to the edge of the seat. Next position the desk stepper so that your shins are nearly vertical as you push down on the footplates. Lastly, as you use the desk stepper, your posture should be such that you are not straining your back or knees. Most of all, the Centers for Disease Control and Prevention (CDC) recommends everyone do at least 150 minutes of moderately intense aerobic workouts weekly. Therefore, daily use of a sitting stepper or a desk stepper for 30 minutes allows you to meet that target in five days. In addition, according to the Mayo Clinic, to get the most out of the sitting stepper, you need to use the sitting stepper for at least 10 minutes. Consequently, three 10 minute sessions throughout the day helps you get the recommended 30 minutes of aerobic workout in a day.